Foster mom, Jacque David, shares with us the following thoughts and success story regarding senior dogs! 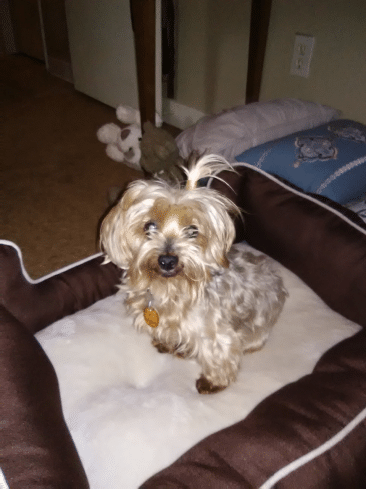 I brought home a 14 yr old female Yorkie from the Lee’s Summit Animal Shelter. She was so very timid of people that she would run from me every time I tried to pick her up. She didn’t want to bite or be aggressive but she didn’t really want me too close nor was she comfortable being picked up. She was so good with all the other dogs from the Labs to the Pom. I just gave her space and picked her up a couple times a day, just to try and show her people are OK.
Like all of my senior fosters, I wondered how long it would take to get this girl adopted. She was totally deaf from years of untreated ear infections and would need ongoing care of her ears just to keep her comfortable. Most of her teeth were missing and she was so very timid. I wondered if she was a puppy mill dog and if she ever would come around. 6 weeks later a wonderful and perfect woman walked into our adoption event at PetSmart Lee’s Summit and fell instantly in love with my little Yorkie girl. She is a senior woman that lives alone. I felt this would be the perfect setting for this dog. The adopter assured me she was patient and would give Lily all the time needed to come around. Lily had a good night! She does spend most of the time in the spare room. Great going potty! She will come out occasionally to see where I am and goes back in her room! I have tons of patience and know in time she will come around and know she is safe with me. She has come so far in a week. She is not as shy and waits for me at the door now. We have hug times several time a day! She likes to be held with her paws on my shoulders. She is such a a blessing. I just cried. It made me so happy to know that I am making a difference in a senior dog’s life. It reminded me that even though many of my seniors don’t get adopted in 6 weeks or 6 months I need to keep doing this because they all deserve a chance.